The Chief Priest of Asantehene Baffour Sumankwahene Asare Ababio on Sunday stormed racecourse market in the Kumasi metropolis to perform rituals for River Subin following traders complaints of low patronage of their goods. It will be recalled that the Kumasi Metropolitan Assembly(KMA) on November 6, 2017, embarked on decongestion exercise to relocate traders and transport operators from unauthorized places to racecourse market. On November 22, 2017, Baffour Sumankwahene Asare Ababio stormed the office of KMA to demand answers to why the Assembly relocated traders to racecourse without consulting River Subin which has its head in the market. The traders after moving to racecourse market have complained about low patronage of their goods and seeing of strange things in the market which they believe is caused by the River Subin god. The traders have also complained that the racecourse market is collapsing since majority of traders are not coming to sell their goods at the market due to low patronage. Otumfour Chief priest including leaders of racecourse market and some traders performed rituals to River Subin to beg for forgiveness for the traders. 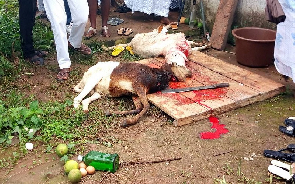 The items of the rituals included 3 hen, 2 Sheep, eggs, schnapps and yam. After the rituals, Baffour Sumankwahene Asare Ababio told the traders that their apology has been accepted by River Subin god saying the traders will no longer complain about low patronage of their goods. In an interview with NEWSMEN, Baffour Sumankwahene Asare Ababio urged the traders to change their attitude towards sanitation in the market since River Subin has its head in the market. According to Baffour Sumankwahene Asare Ababio, business activities will be booming from Monday (today) since River Subin is no angry with the traders. “Now everything is under control. River Subin has accepted the apology of the traders. Things are going to change from tomorrow. But I am warning the traders to keep the market clean because River Subin can’t stay with dirty place. The traders should stop using the River Subin as dumping site. Some of them even throw their menstral pad into the River. River Subin will be angry if this attitude continues” he said. The Queen-mother for Racecourse market Nana Kyeiwaa with joy expressed her gratitude to Manhyia palace for listening to the concerns of the traders. Nana Kyeiwaa called on traders saying on pavement, road shoulders and unauthorized places due to low patronage in the market to come with their numbers tomorrow. She, therefore, assured Otumfour Chief Priest that the traders will change their attitude towards sanitation in the market. Nana Kyeiwaa, therefore, declared one cleanup exercise in every month which the day is yet to fix.